Description Identifying features include Bright Red Eyes and blue leg banding. 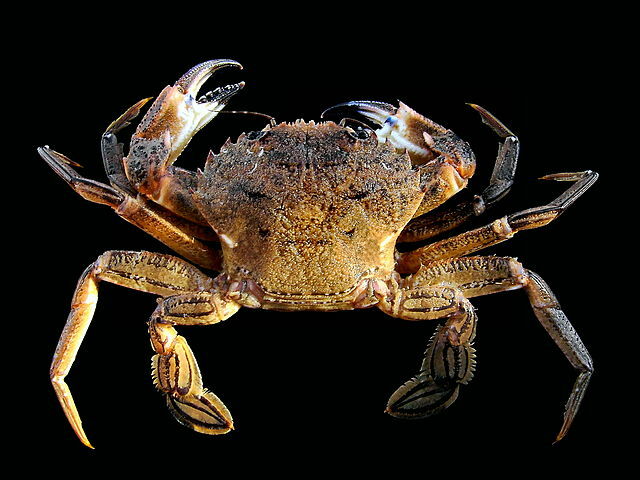 There are also short dark hairs on the crabs body resembling Velvet. This crab frequently swims and is adapted by having paddles on the rear legs.With strong Pincers this crab is Agressive . Caution if handled A fast moving swimming crab, blue in colour but obscured by a brown pubescence with red prominences. The dorsal surface has a finely velvety texture and the eyes are red. It grows to about 8 cm. Carapace dorsal surface flattened and pubescent. Frontal margin with up to 10 narrow unequal teeth, middle two often larger. Antero-lateral margin with five sharp, forward-pointing teeth.